While baseball players and fans worldwide speak different languages, the one thing that never gets lost in translation is the greatness of international players such as Hector Espino, dubbed the “Babe Ruth de la Mexico”. On September 7, 2010, the website for the Mexican Baseball Hall of Fame, known as the Salon de la Fama ran an article entitled “RECUERDAN A HECTOR ESPINO”, which translated to “Recalling Hector Espino” commemorating the 13th anniversary of the passing of this amazing and much admired Mexican sports icon. A symbol of Mexican pride, the slugging Espino (honorary member of the 500 Home Run Club®) is the all-time Minor League home run hitter with 484 long balls. After being named the Mexican League Rookie of the Year in 1962, he led the league in home runs in 1964 and 1972; batting average in 1964 and in 1966-68; and in RBI in 1962 and 1973. His Mexican League homerun record of 46 long balls, set in 1964, stood until 1986. Although he received offers to play for the Cardinals, Mets, and Padres, Espino opted to remain in his Mexican homeland for the majority of his career. He did play 32 games for Jacksonville (International League) in 1964, batting .300, but was offended by racial discrimination and swore he would never again play in the U.S. In 1962 he was the Rookie of the Year of the Mexican League playing for the Monterrey Sultans , batting .358 with 23 homers and 105 RBI leader. 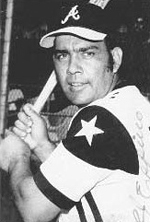 He led the Mexican team to its first Caribbean Series win (1976) and he played in 6 Caribbean Series. He won 13 batting titles in 24 years in winter ball and was inducted into the Caribbean Hall of Fame. He was batting champion in 1964, 1966, 1967, 1968 and 1973 in summer, was crowned in four seasons as the best slugger, drove in runs 1.573, with 2.752 hits, 453 of them homers, accumulating a lifetime percentage of .335.